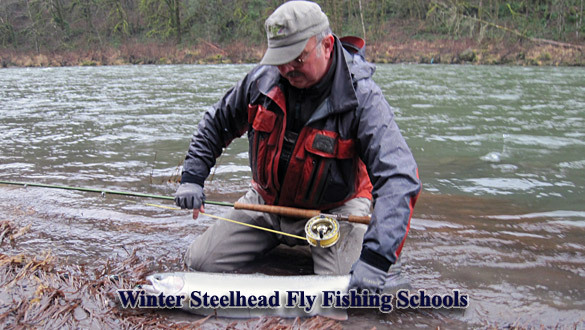 The Fly Fishing Shop: The Winter Steelhead Schools Start this Month. The Fly Fishing Shops Christmas Party. The Winter Steelhead Schools Start this Month. The Fly Fishing Shops has just updated the schedule for this years coming winter steelhead schools. The Schools focus on teaching modern Spey casting and fishing techniques for the Northwest winter Steelhead fishing applications. The Class can be a single or a two day learning experience. The first day putting all the emphasise on the casting of the Spey rods with the use of modern spey lines. The second day is for the winter Steelhead fishing. Putting you on the stream with the best team of guides and casting instructors in the Northwest. A large portion of the day you will be fishing giving you opportunity to catch your first of many winter steelhead.